Solid alumina was reduced by electro-deoxidation to aluminium metal containing 1.8 and 5.4 at% Ca in molten CaCl2–NaCl and CaCl2–LiCl electrolytes at 900 °C, respectively. The potential-pO2− diagrams for the Al–O–M–Cl (M = Na or Li, or/and Ca) system were constructed to predict equilibrium phase relationships in the electrolytes at 700 and 900 °C. 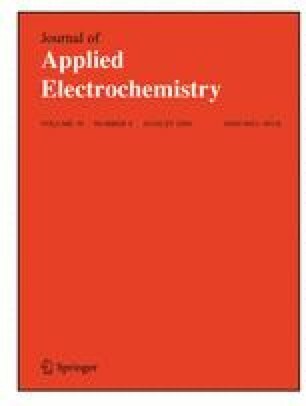 It was found that calcium aluminates were formed as the main intermediate reaction products and were subsequently reduced to form the Al-rich Al–Ca alloys during electro-deoxidation. Calcium and/or lithium, at reduced activities, were created at the cathode especially at 700 °C at the same time as the ionization of the oxygen from the cathode, which resulted in Al2Ca formation. The experimental results were consistent with the thermodynamic predictions. The authors gratefully acknowledge the Light Metals Flagship, a National Research Program of Australia, for financial support. Mrs. N. A. Olshina is thanked for conducting XRD analyses of the samples. Characterization of the samples using the SEM-EDS and EDX by Mr. D. J. Cameron and Dr. A. M. Glenn is appreciated. Assistance from the Analytical Services Group of CSIRO Minerals at Clayton is also acknowledged. Finally, the authors would like to thank the reviewer for the valuable comments that were considered in revising and improving our manuscript.